Who can benefit from eyelid lift surgery? 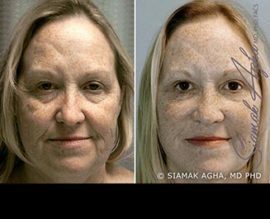 If you have puffy upper or lower eyelids, sagging skin above or below the eyes, or if your vision is impaired by baggy skin around your eyes, then an eyelid lift can help your eyes look more alert and youthful. What are the intended results of eyelid lift? Eyelid surgery, also known as blepharoplasty or eyelid lift, is a procedure to remove excess skin and muscle, usually with some fat, from the upper and lower eyelids. 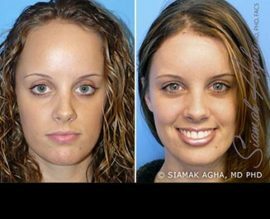 Eyelid surgery can correct drooping upper lids and puffy bags below your eyes. However, it will not eliminate dark circles under your eyes or lift sagging eyebrows. 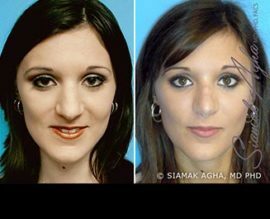 While it can add an upper eyelid crease to Asian eyes, it will not erase evidence of your ethnic or racial heritage. 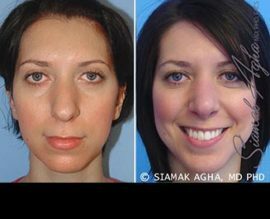 Eyelid lift plastic surgery may be performed under general anesthesia, which is given by an expert anesthesiologist. These services will be provided by the surgical facility where your surgery is performed, and the fee for this service will be billed separately. Blepharoplasty can take one to three hours, depending on the extent of surgery. What is involved in an eyelid lift? 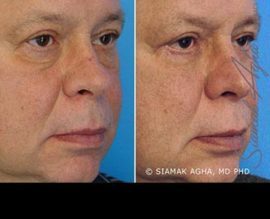 Dr. Agha makes incisions following the natural lines of your eyelids, in the creases of your upper lids and just below the lashes in the lower lids. The incisions may extend into the crow’s feet at the outer corners of your eyes. Working through these incisions, he separates the skin from underlying fatty tissue and muscle, removes excess fat, and often trims sagging skin and muscle. The incisions are then closed with very fine sutures. Blepharoplasty can be done alone or in conjunction with other facial surgery procedures, such as a facelift, to raise the eyebrows or reduce the appearance of wrinkles and crow’s feet. What is the eyelid lift recovery time? When can I return to work and regular activities after eyelid lift surgery? What restrictions will I have? Some bruising and swelling may be present within the first week or so after eyelid surgery. 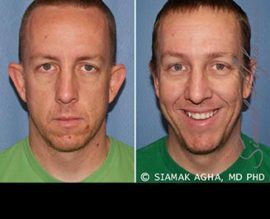 Most blepharoplasty patients choose to return to work after the initial healing is complete in 5 to 10 days and sutures are removed. Residual bruising can typically be hidden with cosmetics until bruising completely fades. Is eyelid plastic surgery typically covered by insurance? The eyelid lift procedure is unlikely to be covered by insurance.